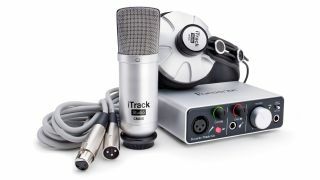 Focusrite have relaunched their iTrack Solo interface and iTrack Studio bundle to take advantage of lightning-endowed iPad connectivity. iTrack Studio is a bundle for would-be iPad sound recordists, featuring a microphone, headphones and an interface - the iTrack Solo. As well as being iPad-ready, the interface also connects to Mac and PC. The iTrack Solo interface scored 4.5 out of 5 in our review two years ago. Focusrite say that the two products will be available in "Early 2015", for the prices of $119.99 for the Solo interface, and $199.99 for the studio bundle.